A Hudson Valley Wedding is always a treat for a photographer because of the rolling hills, barn scenes, gardens, mountains, and other incredible natural backdrops. Some of the best venues for a Hudson Valley Wedding are Belltower Venue, Oak Hill, FEAST at Round Hill, Sixty5 on Main, Tappan Hill Mansion, Senate Garage, Falkirk Estate and Country Club, Cedar Lakes Estate, the Palladian Barn, and the Art Barn. This wedding reception was held at Buttermilk Falls Inn and Spa, a beautiful location regardless of the season. This image shows the couple under the reception tent, surrounded by family and friends. Outside the tent the grounds of Buttermilk Falls have become radiant under the golden light of the moon. Inside, tiny white lights that have been strung across the canopy of the tent twinkle above the wedding attendees. At this point in the evening, the bride has changed out of her wedding gown. She now wears a black and white silk dress, with long sleeves to keep out the chill of the night air. Without the layers of tulle that made up the skirt of her gown, the bride also is able to move about the dance more easily. The groom has kept his wedding attire on, only discarding his formal jacket. Now he stands in a white dress shirt, black vest, and pink tie, as he is embraced by his new wife. 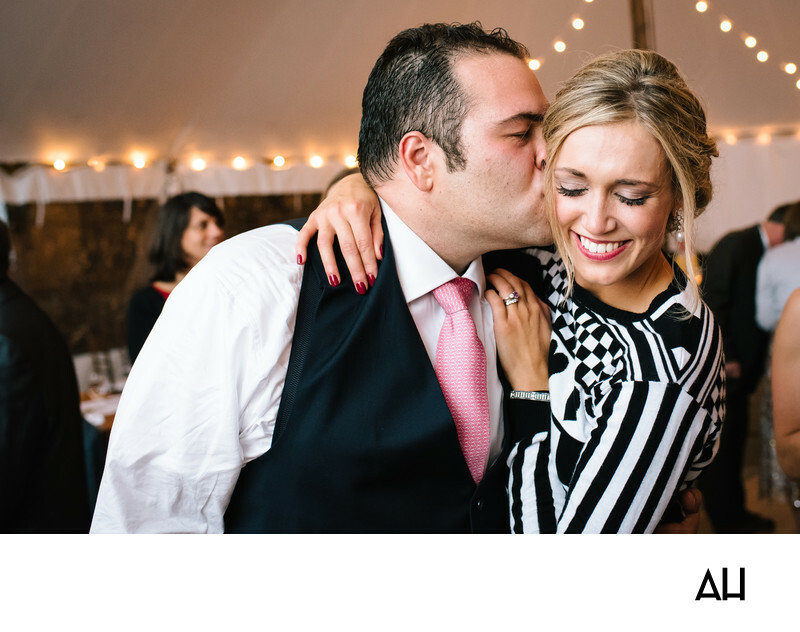 In the picture, the bride holds her husband as he plants an affectionate kiss on her check. Her smile is wide, and it has been throughout this wonderful day. The moment captured is full of love and complete joy as the newlyweds continue the celebration of their wedding day.